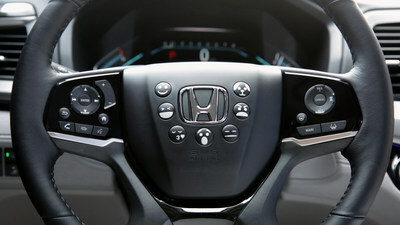 TORRANCE, Calif., March 31, 2017 /PRNewswire/ -- Honda has announced a major update to the conventional vehicle horn with the introduction of Honda Horn Emojis, an integrated vehicle-to-vehicle and vehicle-to-human communications system for the modern driver (https://youtu.be/B1qmmf6cYow). Offered as standard technology on the all-new 2018 Odyssey minivan, launching nationwide this spring, Honda Horn Emojis offer more expressive horn sounds than a traditional car horn, providing drivers a contemporary way of communicating. Already the most popular minivan with individual American car buyers for seven years running, the next-generation Odyssey brings a host of new features and technologies for 2018, including Honda Horn Emojis, the most advanced horn system for driver sound communication, plus available features including: uniquely versatile new Magic Slide™ second-row seats, new CabinWatch™ and CabinTalk™ technologies, new Display Audio touchscreen with Honda-developed OS, 4G LTE Wi-Fi connectivity, new Rear Entertainment System with streaming video, and Honda Sensing™ safety and driver-assistive technologies, now offered standard on EX and above trims. The all-new 2018 Honda Odyssey was designed and developed by Honda R&D Americas. The Odyssey and its 280-horsepower 3.5-liter i-VTEC™ V-6 engine will be manufactured exclusively at the company's Lincoln, Alabama plant using domestic and globally sourced parts. The Odyssey's all-new 10-speed automatic transmission will be produced at the company's plant in Tallapoosa, Georgia. The 2018 Odyssey is the second generation Odyssey to be designed and developed in North America and the fourth generation to be manufactured exclusively in North America. This release is an April Fools' release and should be taken as such by readers and the media.